Before we start the discussion let me ask you one genuine question. How many of you are satisfied and happy with the life that you are living? Are you content with what life has to offer you? There are several reasons. What is something that can buy happiness? Will money buy happiness? What does a happy life means to you? There are several questions like these strolling inside my mind right now. Wikipedia defines happiness as a mental or an emotional state of well being defined by positive or pleasant emotions ranging from contentment to intense joy! Well that's an apt definition. something that can be answered in an English Examination. Jokes apart! If I once again ask you how happy are you , what would you say? Are you ? Are you not? If not I want you to analyze the reason and the root cause. Man is a social animal and he gels along with fellow human beings. Ours is a small world and in this small world to keep our kith and kin happy ,we toil hard. Some do things such as over time and weekend work to earn more so that they can keep their family happy. Happiness isn't all about what all could you do for your loved ones. It is about what all can you do to ensure that they smile forever with you. A smile is the greatest gift that anyone could ever gift anyone! You don't need to give them a costly gift! Just stay with them forever. Let them trust you thoroughly! Win their heart and that's how you infuse happiness into them! But sadly we all live in a competitive world where performance measures your salary and allowances. We toil hard and at times we realize that we weren't that competitive and we stretch and work more! We stay back late and by doing this we should understand that we might be earning bread and butter for our family but what about happiness? If you can't spend quality time with your loved ones then what would they ever think about you. Don't they deserve to get your share of happiness in their life. We are so much engrossed in our every day stuffs that we often ignore many things that are an important part of our life that brings joy and pleasure in our life! And they are our loved ones! Raise your happiness quotient! You entered this world with empty hands and while you perish you won't be taking anything with you. Spend your life in bringing smile on the faces of your loved ones! Help some poor needy kids by offering them free books for their studies and support them in their education by paying their fees. Feed a poor man by buying him good food. It's little deeds of kindness and gestures that will bring joy in the faces of many. And at the first place, try to do everything in limit. I know of people who world whole day and night, weeks and weekends but they should also know that slowly and gradually their social circle would be depleting and that would affect them one day when their own loved ones would see them as a different! Understand your family well, its you who know them better. It's always good to spend time with your family. Trust me even your boss loves his family just as you love yours. Trust me friends, the pursuit of happiness is not difficult. It is on your hands. You don't have to search for it anywhere! Frustrations, Competitions, Pressure are somethings that destroy happiness. They give birth to various lifestyle diseases that will totally disrupt and disturb your so called happiness in your life. If you do everything in certain limits then of course these negative elements would not dare to near you! So how are you going to work on in bringing more happiness to your life? So I do believe that you are happy! Raise your happiness quotient ! 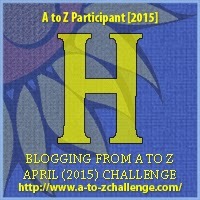 This is shared with A to Z Blogging Challenge! I'm happy because I'm a very thankful person and I know the meaning of being content regardless of the situation. Good health also helps. That's really good to hear Stephen! That's a great thought provoking post. We intend to find happiness in others when it is just around us in simple things. That is good to hear but do ensure that you remain happy forever!